Yep, that’s a little Star-Lord begging for candy. It appears that Guardians of the Galaxy exists in the Parks and Recreation world and you have to imagine that at some point Andy has sat down and watched Marvel’s epic space adventure. This is a fun little in-joke and a nice homage. 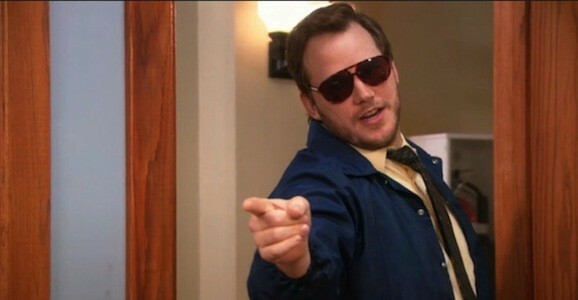 Even though his career is blowing up, it was good to see Pratt back on the show that gave him his first big break—he was originally supposed to be a one-off character but wound up sticking around the whole time. And not that many people seemed to think he was going to become a big time movie star, but here we are. Last night may have marked the end of Parks and Recreations, but you can rest assured that we’ll be seeing plenty of Star-Lord and company in the future. Guardians of the Galaxy 2 is already scheduled to open May 5, 2017, and you most of us will be surprised if the team, or at least members, don’t show up elsewhere in Marvel’s ever-expanding slate of movies.